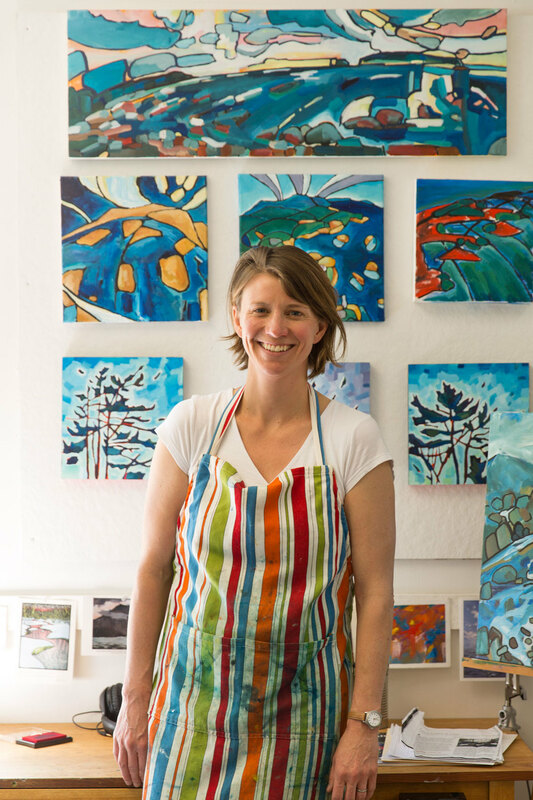 Molly Holmberg Brown, known professionally as Molly Maps, is an artist, cartographer, and educator in South Portland, Maine. I was excited to talk with her because so much of her work addresses the strange and imperfect relationship between our firsthand experience of a place and our intellectual understanding of its physical shape -- obviously a subject that I have found deeply interesting and important for a long time. Molly and I first became aware of each other because at different times, she and I each held the same artist residency on a research ship in the middle of the ocean (which, of course, we talk about below). After that, we connected online to compare notes, and she came to a few of my shows in Maine, but this interview is really the first long, sit-down conversation that we've had. We talked a lot about the imperfections inherent in any visual representation of place and compared notes about the process of using one's artwork as a vehicle for processing interests in place and geography. We also talked a bit about her experience of growing up in interior Maine, living out west for a year or two now and then, traveling extensively, and then moving to the southern Maine coast and starting a family. Unsurprisingly, she had several fascinating observations about the impressions that each of those landscapes had made on her. We talked in her South Portland studio at the beginning of this month in the hours before I had to head up into the city for a gig. This is one of the most recent interviews I recorded, and it represents a failed but -- I swear -- earnest attempt I made to stay on track and keep it relatively short and direct. We did keep it under an hour, but it turned out we had a lot of stuff to discuss. Anyway, please know that I'm at least trying to make these a little sleeker and more economical. You can read more about Molly's work and view a bunch of it at her website, and also follow her on Instagram or Facebook. It was tons of fun to talk with her, and I hope that you enjoy our conversation. Ben Cosgrove: …huh, yeah, that’s interesting. I don’t – OK, hang on, I think I’ve got it rolling, but I just want to check. Yep! OK.
Molly Brown: [laughs] Right. So I’m Molly. What I say with kids is just that: I’m Molly, I make maps, and so... I’m Molly Maps. BC: Right! Well, that should cover it; thanks for your time. MB: Right. Well, I’m Molly Holmberg Brown, originally Molly Holmberg. I grew up in Orono, Maine. BC: Orono! Huh, I didn’t know that. MB: Mm-hm. Definitely. Yeah, that’s really where I was from, and grew up, and where I knew the world from for a while. I had never really lived in southern Maine. BC: And you are a – a "creative cartographer." BC: That’s awesome. I wondered if you could describe your – well, we’ll get to your educational work later, but I’d love it if you could explain your visual work a little bit, because I think the concept is very interesting. MB: Thanks, yeah! I’d say it’s sort of a fusion between landscape painting and mapmaking. It’s a way of putting the two together. When I was a kid and I looked at landscape painting, I always thought it was a little too prescriptive, you know? Too much of the same view. Just so many straight lines and so on. And then when I learned about mapping, I liked it but it was a little too perfectionistic for me, and too abstracted. So I wanted to bring the impressionistic life of a landscape painting into a map. BC: The thing I was struck by immediately with your work is that in many cases, it seems like it’s aiming to capture the experience of a place more than the objective reality of a landscape. MB: Definitely! I think that’s what I’m more interested in -- in the geographic imagination we all carry around, which is a fusion of your experience of a place with this other level of intellectual awareness of what it literally looks like. This sort of fantastical – “oh, you know, if I was a bird looking down, what would this look like?” I think we have some element of that going on all the time, supplementing our visual experience, what we can physically see. So it’s kind of fun to try and put that out there in a painting. BC: Yeah -- that’s cool. Because it’s also always tied to something… concrete, in a certain sense. BC: There’s something inarguable or incontrovertible about, you know, what land you can see. And it’s hard for a map to get at the way we see it. What it reminds us of, what it feels close to, that kind of thing. I guess what I’m saying is that it’s difficult for a traditional map to acknowledge the critical difference between the way things seem and the way things are, and what draws me to your maps is that they do seem concerned with exactly that. MB: Exactly -- that’s well put. And I think sometimes in my paintings, I’ll try to have, you know, a part of it where it looks right. You know, can you have, in the same painting, a real expanse of things looking far away and sort of mappish, or satellite-ish, and then a part of it, which is in the foreground, where it seems like you can just walk onto that land? Maybe even have a figure in the foreground that’s, you know, right there. BC: You mean to get at the idea that we tend to think of the land in front of us as landscape, but as the land beyond our field of vision in this more abstract, cartographical way? You know… in your mind’s eye, you imagine your neighborhood from an on-the-ground, human point of view, but you imagine Newfoundland as a map of Newfoundland. MB: Absolutely. I think that’s so interesting, and it’s one thing I’ve tried to capture in making some of these paintings. BC: You have a couple others, too, that – well, I like the series you show some of on your website, in which you show a map with different sections that are sort of swollen or shrunken to reflect the particular experience of the mapmaker. Like there’s a map of the United States in which you documented the adventures and experiences of a particular couple…? BC: And you know, the northeast is gigantic because there are so many subcategories within it, and then a few feet away is, you know… Colorado. And then the Pacific Northwest. With little anonymous trees and abstract greenness in between them. MB: [laughs] Yeah! Those watercolor mental maps… those were kind of how I started. Just pulling out people’s experiences and projecting them onto a conceptualization of a landscape that might match the way that person imagined it. Emphasizing what matters most and then sublimating everything that isn’t, you know, in your mental view of the world through that lens. Which I think is how we operate! MB: The New Yorker’s View of the World? MB: Ha, totally. I mean, yeah, that’s the goal with those – to try and get inside someone’s head enough to do it accurately for them, given that it’s not my experience. BC: Huh. What’s your check on that? How do you know when it's successful? MB: Hmmmm, well, I show it to them a lot while I’m making it, you know, just, “do you recognize this as accurate?” and that kind of thing. I think that can be… that’s easier on the mental maps of places like the US, where there’s some kind of recognizable scale and things pop out. But it’s harder for smaller places, like – even when I do people who live on the coast of Maine, or… this Boston one, where is it? This one here is a birds-eye view of the Charles River, but would you ever know it if I hadn’t told you? MB: Ha, well… yeah, most people don’t immediately recognize it. But you’ve spent a bunch of time down there, I forgot. BC: Ha, yeah… in fact, I just finished up a sublet that was [points] right there. MB: It’s weird, though – certain people will get it and certain people won’t. Maybe just because not everyone conceives of places in a birds-eye view. It’s on-the-ground or a straight-on map, but things in between can throw people off. It’s one of the challenges when you try to make things slightly more expressive. I don’t even know Boston – this was a commission, and I was mostly working from maps for it. But you know, you don’t want to make everything… freakin’ perfect. But then someone will be like, “hey, my house is here and you skipped it, and you’re missing an island,” or whatever. And then they won’t want to buy a print. BC: Huh, that’s interesting – so in this case, you’re not working from your own experience of this place, but of looking at other maps. MB: Ha, thanks. Yeah! I mean, some of it, when I do these, is sort of that hope that – well, number one that it’s a unique expression. So people haven’t seen this view of it; they may know this place but haven’t seen it from quite this perspective, and maybe that’s refreshing. But then secondly, this sense of symbolism in maps, which I think is really powerful and interesting. You’re dealing with – well, semiotics is the fancy word, but I can just do a drawing, with a little house here, and put “Ben’s Home” on it, and you would transfer your values right onto it. It’s got nothing to do with my abilities as an artist. BC: Huh, yeah, there are all these very powerful shortcuts to emotional resonance and opportunities for… for projection, I guess. Intended or not. MB: Yeah! Intended or not. You can either look at that as a risk or as an opportunity though -- as a tool you can use. In some ways it makes the job a little easier because you can use symbols and people will attach a lot of meaning to them right away, although you do give up a little control over how they’ll interpret the whole thing. But it’d be much harder, for instance, to be a portrait artist, I think. MB: [laughs] Exactly. Or, you know, just as the artist, to look at this person so long and still feel that you’re not quite getting it? That would be so frustrating. BC: That’s interesting – what would you say to the idea that we live in a world now, with Google Maps and everyone carrying that infinite, identical, ubiquitous map of the world in their pocket, where everyone shares a specific, agreed-upon conception of what the world looks like, perhaps more so than at any other point in human history? Does it make your work of making maps that are geared more towards experience and imagination different than it might have been at some other point in time? For instance, does it make the risk of, you know, “that’s not my nose” somewhat greater, if so much of the world shares precisely the same cartographic understanding of the world? MB: That’s an interesting question. I honestly think that in some ways it’s great because it’s like bringing a burrito to a place where everyone just eats white bread. You know? Like, we’re really not exposed to that many cool maps that often. And I think when people do see it in a different way, it’s kind of refreshing and even mind-expanding. I think that convention has sort of drowned out a lot of things that a lot of map-lovers love – you know, pulling out your atlas, or getting a friend to draw you a hand-drawn map of where to go – stuff like that happens less and less. And I think that helps the work I do maintain a certain level of specialness, just because we don’t see maps like that so often these days. At the same time… it’s super convenient that at any time you can pull out a map of the entire world. MB: With infinite detail. Well, kind of! But another thing that’s really interesting to me – well, interesting and scary – is how top-down that map is… it keeps getting redesigned to engage with you more explicitly as a consumer, not necessarily as a person thinking about the shape of the world. It’s on us all the time, too, you know? My phone knows where I am, and it tracks you, and so on. And the information it presents is so tied to the interests of the company – companies – behind it; it’s hard for us to be proactive about… well, how to use this amazing tool for ourselves. BC: Your maps also… well, maybe precisely because they don’t have infinite detail, in making them, you’re compelled to make much more dramatic creative decisions about what elements of a place to emphasize or deemphasize. Since Google Maps still can’t ultimately know what everyone will use its maps for, it has to cover everything, even if it’s emphasizing certain pathways and businesses, and so on. You are able to be very expressive by making those different choices. MB: Right, right, right, exactly. For instance, there’s huge limitations on what Google Maps can give you, right? I mean, there’s only certain levels of scale – you’re not zooming in smoothly. They have a discrete numbers of scales you can zoom in at, and each one you zoom into has its own decided level of detail. Like, maybe you love this particular island, but if you zoom out one click it’ll disappear. And that’s just a rule in a computer – it doesn’t have to disappear – but we’ve just become used to the idea that we shouldn’t, you know… we’ve accepted the notion that once you zoom out to a certain level, a particular category of information becomes irrelevant. BC: Which isn’t really consistent with our experience, or with how we’d naturally visualize that geography. MB: Right – if you live on that island, for instance, at no point do you forget that it’s still there, just smaller. But because a computer is trying to automate this huge thing, they have to cut out that data. But the island is still there. And then like shapes, too – like things we don’t look at very often. This one is… [shuffles some paintings around] This is Hudson Bay down to the northeastern US, and this [shuffles], this one shows the area where Russia and Alaska meet. BC: At the seam of the map. MB: [laughs] It’s the seam! Ha, exactly. Yeah. I think if you really only live inside a certain cartographical reality, these shapes would be surprising to you, because the angles and perspectives aren’t ones that you might be accustomed to. But the shapes are there. BC: That’s interesting though – where is the line, what is the difference between a landscape painting and a map? When is something not a map? MB: Huh, that’s a good question. BC: I mean, I experience many of your maps in the same way that I experience landscape paintings, in that I perceive the subject matter – the interesting thing – to really be what you choose to emphasize or deemphasize, or focus on, or ignore. MB: Right, and I think that’s kind of where I like to go. I don’t like to always claim that they’re a map. Maps are, in a certain sense, hard to define: when you get the broad definitions of “map,” they could totally even include landscape paintings. “Map” is like, “some kind of surface exhibiting spatial relationships between entities.” So, great! Like, that’s basically… everything. MB: But with some prints and things, I’m happy to say that they’re not maps, they’re views. BC: They just acknowledge that a view in your mind’s eye often includes a map, on some level. MB: Exactly. It’s just being art, really. Presenting things in refreshing ways that feel honest and interesting. Like this one, it looks like a map, but it’s just landscape painting on a bigger scale. BC: Yeah, or… a more abstract understanding of a landscape, maybe. Like the one you indicated earlier, the one of Russia and Alaska, that’s not a view that exists in most people’s lived experience of those places. Just a handful of astronauts. And yet, we all know what Alaska looks like, intellectually, from looking at maps. BC: Wow, yeah – that’s awesome. Yeah, it starts at the top with a head-on view of the island, but lifts into an aerial view as it bends towards the shore. It looks like a panorama you might take with your phone from some impossible vantage point. BC: No, I knew immediately what it was! BC: Yeah, I mean… the profile of Monhegan has a pretty distinctive shape, with Manana and stuff. And that’s Port Clyde and all that stuff in the foreground? MB: Yep, exactly. I mean, that’s why I wanted the island at the top. And the rest, I sort of wanted it to feel like you’re on a ferry. BC: Well, I mean, it’s sort of like – well, I’m trying to think of how to articulate why I like this so much. I think it’s that when you’re on the mainland, you know, driving to the ferry, you’re more concerned with an aerial map-view of where you are, navigating to the harbor. But then once you’re on the boat, you take more of a bird’s-eye-view, and then when you finally approach the island, you engage with it from the perspective of a human-sized figure. It feels like such an honest representation of how we see and imagine landscapes totally differently as our spatial circumstances and navigational concerns change. BC: I mean, this is really part of what speaks to me about your work in general – that, well, I think imbuing a landscape painting with that element of cartography makes it feel like a more honest representation of how we hold a place in our minds. Like how this one really seems to capture how one might visualize Monhegan relative to the coast. MB: Well jeez, thanks, thanks very much. Yeah. Have you been out there? BC: Yeah, I actually wrote an essay a couple years ago about Rockwell Kent, and, you know, the years he spent out there, digging wells and painting islands and forging his philosophy in general. It seemed to me that that was the period where he really kind of became... himself. MB: Totally. I love Rockwell Kent. BC: That makes sense – I mean, your sky up there, in that Monhegan painting, that’s very Kentlike. Kentish. MB: Ha, thanks. I mean, I try, definitely. I try to… to get near his ability to show things as both… intimate and mythical, I guess? You know what I mean? BC: Absolutely. How he could take all this everyday, vernacular subject matter and render it in such a way as to make it seem almost… exaggeratedly profound and important? MB: Totally. Like, even some of his Monhegan stuff, which I know was early, but he’d take just a landscape scene… he’d just, you know, go to the lighthouse and paint Manana, but makes it look so mythical, even fantastical. He’ll overemphasize, like, the sunset and the whole painting is just like, BOOM. It seems so big and profound and important, but at the same time, it’s grounded in this… this ordinary moment. I love how he could do that. And even in his prints too. BC: Yeah, like the way he did people – they all look so blocky and solid and indestructible. Which had to come from his political philosophy in some sense. MB: Oh yeah, it’s super socialist – when I took the train across Russia, I remember marveling at how all those statues and paintings in all these places in the old Soviet bloc look like Rockwell Kent’s people. They’re all that kind of thick, solid… that’s where Kent got it, I think. BC: Huh, that makes sense, for sure. MB: Yeah, you know, it’s that very agrarian, strength in the common man, workers of the world unite, that kind of thing. BC: Well yeah, and his decision to imbue every figure with that same strength, regardless of social station or origin or anything, that seems significant too. He was very consistent in that way. And pretty obsessively political. And he did make a big point of claiming that he felt no division at all between his art and his life, or his experience of the world, so I’m sure that’s all no accident. BC: Ha. Well, yeah – I meant to ask earlier, just to jump back for a second… not to probe too deeply into your psyche, but why are you interested in this? In geography and maps? And when did you discover that you were? MB: Ha! That’s a fair question. Well… I knew I really loved visual art and painting as a kid. And I was really drawn to, well, artists like Rockwell Kent and N.C. Wyeth and these other artists from Maine that I was exposed to. And then I liked to do art in school…but wasn’t really exposed to geography until college. That’s when it really started to seem to me like the whole spatial perspective thing that could be explained through geography – well it just seemed like a great way for me to learn. I’m a super visual learner; I’ve always loved graphics and visuals. And so this, what I do now, it’s just a way to get out this deeper… it’s just what’s inside me. [laughs] You know? Just wanting to articulate these feelings about space, and landscape, and place, and finding a visual language through which I feel I can do that. MB: [laughs] Yeah, I mean, I had help. But yeah, then we did it again when I was in sixth grade for – my parents were on sabbatical and we did a year in Utah. So -- yeah, we drove across when I was three and lived in Washington when I was little, and went up to Alaska, and drove back, and then the Utah year was in sixth grade. BC: Wow, do you have memories of that? The trip when you were three? MB: Oh yeah, definitely. I have distinct memories of sitting on top of the U-Haul, taking a break at a pull-out, and even at three having a sense of that… that expanse. It was probably somewhere in a Dakota or something. But it made a big impression on me. It just felt like I was on a different planet, given that I grew up in interior Maine, where everything is very… closed-in. BC: Ha, yeah, I have a whole song about that feeling. But yeah, that’s amazing, given that I’m sure most things feel like a different planet when you’re three! BC: Did you major in geography? BC: And sorry, where was college? I’m just trying to keep track of all this moving around. MB: Oh, I was at Middlebury. BC: Right! Oh yeah, that’s right, we talked about this. MB: Yeah, you had some connection there, right? BC: Yeah, I didn’t go there for college, but my parents did, and a handful of other relatives. I’m... I'm not of Middlebury, but I'm made from Middlebury parts. MB: [laughs] Right, and you… you played there or something? BC: I had a really great fellowship there a few years ago, a journalism fellowship. And I’ve got a bunch of friends who came out of there… and I guess I’m in that Addison County area pretty frequently. Proud to inform you that, ahem, a reporter from VPR once called me an Honorary Vermonter, which is the highest praise I think I’ve ever received. MB: Ha, I’ll say; they’re pretty stingy with those. MB: Well yeah, hang on -- I was going to ask you what yours was. How did you come to write music about this stuff? BC: Huh, that’s interesting. It’s actually very analogous to your story, in that I was always, you know, a musician, and I wrote music, but it wasn’t until I got to college that I discovered I was interested in landscape, and environmental history, and the built environment, and geography, and all that stuff. Place, especially – like, qualitatively articulating why one spot is different from another and why it feels different to be in Montana versus Maine, that kind of thing. And so in the time since then, my life has been all about figuring out how to most effectively use my music as a tool for processing those passions, those interests. Which sounds similar to your story, a little bit. MB: Yeah, for sure. Do you know why you were… why you were first drawn to it? BC: Man, for the longest time I didn’t know the answer to that. But after some probing, I really think part of it came from… well, I was a college kid, so in retrospect part of it at first was definitely from trying to get my head around who I was and where I was from. You know, I had grown up most of my life in basically one spot, and then lived full-time in a new place for the first time, and I remember being struck by how hard it was for me to articulate what it was that made Cambridge so unbelievably different from the places I’d grown up in, even though they were just about an hour away. I really wanted to be able to put language to that, to where that difference came from. And then I wanted to be able to explain what made Boston different from Vermont, or from Maine, or from central Massachusetts, and then what those places also had in common. I became pretty obsessed with it. MB: Yeah, I think we have those distinct things – it can definitely make you – I think in a certain sense, you can’t really know a place until you leave it, or it’s taken from you. BC: But then surely your view on it is distorted by the particular circumstances of wherever you end up. You’ll view the places you’ve been before differently depending on where you’re remembering them from; it’s not necessarily that you gain a more objective perspective. If you move from, okay, say, Burlington to New York, you’ll remember Burlington as simple and quiet, but if you move from Burlington to Middlebury you’ll remember Burlington as crowded, loud, and expensive. That’s a hackneyed example, but you know what I mean? Move from Portland to Minneapolis and you’ll remember the ocean, but if you move from Portland to Lubec you’ll remember how bustling it is. MB: Yeah, I mean, maybe that’s the thing – there is no objective view you can have on a place; you can only try and maintain an awareness of what’s coloring your perspective. And they change, too, right? MB: I remember when we left when I was in sixth grade, it was pretty traumatic – I had just, you know, started to make really close friends and started to date, and BOOM, I was suddenly yanked away and plopped in Salt Lake City, which felt totally foreign and weird to me, for a year. And I came to like it, but then, you know, we went back! And I got plunked back in. And somewhere along the line I came to feel a sense of home, or a sense that there was a place I would keep returning to, and that’s what Orono – or Maine – kind of came to feel like, maybe earlier than most people develop a sense of that kind of thing. MB: Yeah, totally. So did you miss the place where you grew up, when you were in college? BC: Ha, that’s the weird thing – no, not really! It was most just that I was weirded out by how I couldn’t explain it. My friends were from like, Vermont. Or the North Shore. Or Philadelphia. Like, these places that were all pretty conjurable in someone’s imagination if you just said the word. But I was from this area on the MA/NH border that wasn’t really a suburb, it wasn’t really an exurb, it wasn’t really rural, I couldn’t really explain what it was. Post-industrial, but there’s also some small agricultural areas, and the region’s kind of historical, but also increasingly crammed full of strip malls and stuff. Plus, northern Massachusetts is weirdly on this boundary between the type of forest that goes all the way up into Quebec and that which goes all the way down to Georgia, so it’s hard to get a bead on, even ecologically. And it sounds crazy, but that was all strangely destabilizing for me, particularly because I felt kind of like a fish out of water – a very lucky, uh, imposter fish out of water – for much of the time I was at college anyway. BC: Yeah, but you know… I got it together by the end. MB: [laughs] Yeah… I mean, to your main point, I don’t think we have very good words for that kind of thing in general – for the ways that places are distinct from each another. Or we just come up with the same mundane ones: “suburbs,” “rural,” that kind of thing. Like, we just moved down to Cape Elizabeth and we had sort of a hard time finding it. Geographically, it was really appealing to us in that, you know, there’s more space than Portland and we wanted that expanse – we missed a little of that feeling of expanse that you get in the west. So we thought, like, “what’s the place around here that has the closest thing to that feeling of openness while still being close to Portland?” And down here you get a little more of the fields, and the sense of the ocean – the ocean is very apparent down here – and just this sense of [spreads arms] open-armed broadness. For a state with so many closed-in, forested landscapes, Maine also has some surprisingly open-feeling places. BC: Yeah, for sure. I actually – I always think of Popham Beach in conversations like this. To mind, that's just an excellent example of that. As a place that really feels more like the west than anyplace else in the east does. BC: [laughs] Ha, yeah, exactly. This huge, broad, sandy expanse, and the sky is enormous and you feel like you can see everything. MB: You’re right – I think that is such a magical beach, and so big, and almost Mexico-ish at times. I was always so frustrated, growing up in Maine, by that feeling of how you can’t see anything, and the trees are right next to the roads, and all that. And after I’d moved west I really wanted that space. So it’s been great to rediscover places like Popham and down here, where those conditions can really be met. Because I didn’t really want to live back in that closed-in type of landscape completely. MB: Yeah, exactly. Although I have to say, I really love the river. That’s another thing we could talk about, is rivers. Because I am – as is my husband – we’re kind of, you know, river people. Like, we didn’t grow up on the ocean, we grew up on a river. A BIG river. MB: Yep! And also the Stillwater, which kind of ducks around it. BC: Where is your husband from? MB: Same river! But ha, yeah, I feel like I got the better spot. But yeah, we’re river people, and I do miss the river for sure – having that kind of constant… motion. I don’t know, it’s hard to explain, but you know what I mean? Just a different type of energy from what you get here at the ocean. BC: How would you describe that difference? MB: I mean, in some ways it’s really – it’s so local. It’s just a slice. You can see the water move by; you can see that passage. And you can see the other side, which stays still as the water moves, and so the whole thing feels very local. Like, that’s where the river is, between here and there, and the flow is in that direction. BC: All the movement is consolidated spatially. And it’s a knowable… vector. It's moving consistently in one direction, in a way that's, you know, dependable. MB: Yeah! Yeah. In some ways it’s a very concentrated feeling… it’s almost more powerful that way. Obviously the ocean is powerful, and obviously it’s enormous, but it’s really… it feels subtle to me? BC: Maybe because all that energy is diffused over such a huge space? MB: Ha, I mean… yeah, I don’t know. I mean, tides come in, tides go out, waves break, and whatever, but you can’t really see it all; you can’t get a sense of the whole picture. BC: That’s an interesting point. Because obviously the ocean is changing so much more wildly and chaotically and constantly than the river is… but maybe in a way that affects you less, as a person on shore, than watching a fast-moving river might. You’re able to perceive more of the life of that river from one vantage point than you are of the ocean from one random beach. MB: Yeah, the river is more intimate, and as you say, it’s one-directional. Its scale is more graspable for a human – it can be more of a… a friend, you know? MB: The ocean is so, so expansive. It’s interesting to think about. BC: Speaking of that… what did you ultimately do for your artist-at-sea residency? MB: Smooth transition! Do you want to see? BC: I suppose we should say, for the benefit of anyone listening to this, that we’re referring to an artist residency we both did, at different times, on this research vessel that kind of floats around the world. Where… where was yours? MB: Mine was from Samoa to Hawaii. [rummaging through papers] Here you go. MB: These are some more abstract ideas… here are some derived from the navigational equipment on board. So there’s that. And then the scientist that we had on board was doing some geological stuff, with these fracture zones. So I made this, almost just based on a drawing he did for us once… you have these fracture zones and these fault lines in the ocean – see these here? – and they’re kind of a scar that indicates where it’s opening and which way it’s spreading. MB: And so he was really interested in these, like, trapezoidal shapes here were formed. He was looking for these patterns in the mapping we were doing on the ship; he had this interesting hypothesis about the movement that had formed them. BC: That’s interesting. These are beautiful, too. BC: A bunch of leaves. MB: [laughs] I brought some leaves. I mean, a bunch of random stuff. I brought watercolors, I brought acrylics… I had no idea how much I was going to be able to get done. But this was such an opportunity for me, the last thing I wanted to happen was to get out there and, you know, run out of supplies. So you should have seen what I flew out to Samoa with. I had like, this gigantic roll of canvas, and sticks of wood, and all this watercolor paper… I mean, it was pretty cool. I actually got a LOT of material out to the middle of the Pacific Ocean. BC: How was – well, what was your experience like, being on the ship? Had you been at sea before? MB: Oh, not really. Ferries and things. But nothing on that scale at all, and as you know, it’s totally different. BC: Can you say more about that? I mean, to tie it back to what we were saying earlier about not being able to see past the trees and things… it seems like, you know, a totally opposite set of spatial circumstances. MB: A different scenario! For sure. I actually loved that feeling. And to be honest, a big reason I went, even though I knew it would be a little monotonous, was just that those… memories you take with you… well, you ultimately forget how monotonous something was. And for another thing, monotony can be good because it gives you time to really solidify an experience in your mind. For instance, I love that I can so clearly remember riding a train across Russia and just sitting in the back of the caboose, listening to, like, god, I don’t know, whatever cheap Chinese CDs I got – Moby? BC: [laughs] Yeah, he’s the traditional soundtrack to the landscape of eastern Russia. BC: Yeah, I felt the same way. The idea that it would help contextualize your continual sense of where you are. MB: Totally. It can help you to know the world better. So then, of course, when you get down to brass tacks, the day-to-day elements of it are pretty… well, it’s just the day-in, day-out life of being on a boat. You’ve got a few rooms and a deck, and you see the same people, that kind of thing. But I was psyched – I had a lot of things to mess around with that I hadn’t had the chance to do before. So I was stoked, like, “okay, cool, just let me – I’ll be here, and I’ll eat food, and I’ll just crank, and whatever.” I generated a ton of work out there. And I was pretty content. Granted, there was some sense of like, “aw, I wish we could stop at an island” or “I wish we could scuba dive” or whatever, but in general it was good for me. So yeah, these are some of the other things… this is a graphic showing changes in the earth’s polarity over time… these are, well, these are just some drawings showing the movement of waves. MB: I thought what you did was pretty cool! Didn’t you take, like, the various variables… pitch, heave, speed, that kind of thing, and convert those into music? BC: Thanks! Yeah, the main piece I wrote for them took the ship’s speed over water and its speed over ground – which are almost never the same – and mapped each of them to one hand in a piano part. And the thinking was…. well, so when those speeds are similar to each other, the piece rolls pretty steadily, but in the moments where your actual motion and your experience of that motion start to deviate from each other, those are the moments where tension and discomfort builds in the music, because those two rhythms are pulling apart from one another. MB: Gotcha. That’s so cool. What is the name of that piece? BC: Ah, it’s called “Over/Under,” mostly because… well, I couldn’t think of a better name. I’ve never been totally happy with that one. MB: [laughs] I think it’s great. And it’s not on… it’s not on the Salt album, is it? BC: That one’s not, no. The ocean song that I wrote that did make it onto Salt is called “Landfall.” But yeah, that album was such a specific and internally consistent thing that I found it really hard to cram onto it other songs that didn’t really fit. It’s more like a suite of songs by itself – they’re all closely linked together, and they share a lot of the same melodic material, and the narrative of the whole record is this very particular thing – and while “Landfall” made lots of sense in that context, it was going to be really hard to get “Over/Under” onto there, even though it’s built around such a similar concept. MB: So it’s just a standalone piece? I can only listen on YouTube? BC: Yeah, for right now, anyway. Or… I mean, I can send you an mp3. I am, you know, the distributor. BC: No! But yeah, I… I do totally take that for granted. BC: No, no, no… I would like, you know, a house at some point. A fixed address, at least, or, like, a life that will stay intact even if I wander off now and then. MB: I mean, that’s a thing about place. You know, once you do get settled, what is that like, and how does that change… well, because I did travel a lot and then kind of had to ramp it back down. How important does travel stay, and how do you travel differently at different times in your life? Like I was talking to my husband the other night – we have all these places we want to go, but if we wait and hang on until you know, we’ve got the freedom and the money, we’re going to travel like we’re 55-year-olds! We don’t want to travel like 55-year-olds; we want to travel like 25-year-olds. It’s like that old saying, you know, youth is wasted on the young. By the time you have any money to do all the stuff you want to do, you don’t really have the time or inclination to do it. BC: Huh, that’s interesting. But don’t you find there’s a lot that’s rewarding – obviously motherhood and having a family must be unbelievably rewarding, but I mean just in terms of digging into a place and feeling like you belong there? BC: That’s very, very, very interesting. Like, there’s less at risk; it’s harder to compel yourself to feel like your experiences when traveling are part of your normal life and not separate from it? MB: Yeah, a little bit! Your perspective changes, you feel more like a tourist. You may be in a wild place, but you know where your real life is and it’s… well, it’s somewhere else and you can picture it vividly the whole time. Ha, this is probably another thing that is completely foreign to you. BC: Ha, sort of, but it reminds me of… well, this obviously isn’t quite what you’re talking about, but what you’re saying resonates with an experience I do have, which is – well, so I hardly ever fly anywhere, just because I’ve got to bring all this musical equipment with me wherever I go, and plus I just like driving better because you get to see everything around you change. But I just got back from flying out to California for these gigs and I felt pretty disoriented, completely alien the entire time I was there. And I’m 100% certain it’s because I arrived on an airplane and sort of wandered around this other world for a few days, then got back on an airplane and vanished back into the dimension where I started from. When I drive somewhere, or especially if I walk or bike there, it really, honestly leaves me with a better visceral understanding how all these different places are connected to each other. Or that I belong there. MB: [laughs] Yeah, you just teleport in and out. And then, yeah, you’re right – you get back and your normal life is just sitting there on ice, waiting for you. BC: And with this time in between all spent in a totally weird, liminal space where you’re just crammed between a couple of strangers in a dark, air-conditioned tube with some headphones on! Yeah, it’s totally unsettling to me. When you’re on a plane, where are you really? It seems completely different from moving across a landscape. MB: It’s true! Yeah, “portal” is such a great word for it, what you describe. You just pop out somewhere. Cause yeah, I’ve, like, popped out in India before, or popped out in Samoa, popped out in Russia. And it’s hard to sort of… process where you are or how fast you were moving or how far you’ve gone. To understand anything about, you know, this journey you’ve just taken. You just land and you go “oh great, I made it!” and you throw a bookmark in your book and step off into a different world. You know? I like, intellectually get how I got here, but it doesn’t… it doesn’t feel like I should be in India right now given that I just sat in a chair and napped and read a book for a few hours. BC: Ha, yeah! Anyway, when I was a kid, we would go into Boston, me with my family, and we’d navigate the city mostly by subway. So we’d park the car up on the Orange Line somewhere and then ride in and pop up at like, Symphony Hall, or Quincy Market, or Kendall Square, or whatever. And so I got to know the city as this series of… well, nodes. But then, I went to college down there and I brought my bike and slowly began this process of fixing the position of where those nodes are in relation to each other. And I cannot describe the flood of endorphins that I regularly got from just feeling my mental map seismically rearrange itself to accommodate some new information. Just the hydraulics of my brain grinding and groaning as Central Square moved like, way down here! Or Jamaica Pond moved way over here. And now my mental map of Boston is a pretty faithful topographic projection, but it got there from being an almost random scattering of utterly discrete data points. MB: That is so cool. And yeah, that’s a great example of how your spatial understanding of a place can shift as you throw more knowledge and experience into the mix. BC: Yeah, it’s weird how… I mean, we could both name, you know, most of the buildings between here and downtown Portland, but then after that, there’s like… you know, some other stuff and then New Hampshire. MB: [laughs] Yeah, definitely. Our sense of scale is totally affected by the level of geographic detail that our mental maps include. It reminds me of – well, I did a map of Bangor. And that was always a town, when I was growing up, that like, my parents would drive me in. So I knew a lot of spots in it, but really had no idea of where they were relative to each other. It wasn’t my hometown – I mean, I could have drawn a map of Orono in a second – but Bangor was always really weird. BC: That’s so interesting. I totally identify with that. And ha, that’s such a great example, too; I feel like Bangor is pretty strangely laid-out even if you DO look at a map of it. It’s got… well, like, weird chunks in weird places. MB: Ha, weird chunks in weird places, for sure. I also think, like, mall areas, strip malls, commercial areas, that kind of thing, those can throw you off. Because their scale is totally off, and they don’t really hew to the landscape – or to the structure of the town – in the same way that most development does. BC: Ha, yeah, I mean, the place where I grew up was definitely that way. That’s interesting though, about the commercial strips; have you read much J.B. Jackson? MB: I KNEW YOU WERE GOING TO SAY THAT! Yes, definitely. He was actually one of the first people I read that made me want to be a geography major – even though he wasn’t really a geographer, he was like, a… landscape writer. He didn’t really like geography. BC: [laughs] Yeah, he did seem to be pretty… vocal about stuff he didn’t like. MB: Ha, yeah, he was kind of ornery, wasn’t he? MB: Ha! That’s hilarious. Yeah, he seemed like a cool… person. Just the perspective he had and the way he wrote about things. He was one of the first people that I really decided I wanted to kind of file away and build into my own view of the world. That sounds weird, but you know what I mean? BC: I think I do. BC: Oh man. Yeah, absolutely. And then you just kind of pack it onto the, uh… multi-colored Play-Doh ball of your identity. I mean, if I’m honest, that’s part of why I’m doing these things. The more I can learn about how other people – other people that I admire or whose work fascinates me or whatever – how those people think about place and space and the world, the better I’ll know my own feelings about how to be a person on the planet, how to live a life, all that kind of thing. MB: It’s a cool idea. I’m always trying to think of ways to stop myself from forgetting my influences. I make these posters and things. Anyway, how did you get into this stuff? I feel like most normal people don’t know J.B. Jackson. Did you study this in college? BC: A little bit – do you know John Stilgoe? BC: So he sort of became the professor of landscape history at Harvard after J.B. Jackson flipped everyone off and moved to New Mexico, and he’s been there ever since. You’d love his work, I think – his first big one was a book called Common Landscape in America, 1580-1845 and he’s written about suburbs, trains, shorelines, all that kind of thing. Some really good books. I got really, really into his work in college. And I was never actually able to take one of his classes! But I’d wake up early and go show up like an hour before his lectures – he’d always be there early, drinking tea and sort of holding court – and talk to him about this stuff whenever I could. MB: Ha, that’s awesome. I’ll have to check him out! BC: Definitely do. He’s got a book, Landscape and Images, that you’d probably especially like. MB: Huh, cool. Writing that down. But what else did you do in college? BC: I mean, I was a music major, which meant I was compelled to devote most of my credits to like, Theory II and Performance Analysis or whatever. Towards the end of college, I was able to take some courses in like, literature of the American environment, creative nonfiction and that kind of thing. I got into environmental history, read a lot of stuff by like, William Cronon, all that. Although I was a music major – and I’m still sort of glad I was – I sort of spent the bare minimum amount of time in music classes while I was there; I was totally determined to walk out with, you know, a really multinucleated, liberal-artsy experience. And now I… I guess I write music and nonfiction about place and landscape, so my life has proceeded oddly directly from the kinds of stuff I did in college. BC: Ha, in a sense. I’ve said before that the thing I did in college that most directly prepared me for my life afterwards was a gig I took driving across the country to write for a travel guide one summer. MB: Ha! Yes, that makes sense for you, totally. But I'm interested to know how… well, how did music and landscape studies come together for you? BC: Oh -- of necessity. BC: Ha, I mean, I kind of emerged from college having discovered that landscape studies, geography, environmental history… these were all the places where my passions were, but music remained my only, uh… viable skill set. So I kind of set myself to figuring out how to use music as a way to process my other interests. So like, my senior thesis was a musical piece, but it was structured as a west-to-east flyover of the state of Massachusetts and it used, like, topography, population patterns, ratio of paved to unpaved surface, that kind of thing, as triggers that would affect the texture of the piece and guide its narrative as you moved across it and watched it change. MB: Wow, that sounds cool. MB: [laughs] That one’s not going in the box set? MB: It’s a really cool idea! BC: Thanks! Yeah, I do stand behind the concept still, I guess. But yeah, for the most part, although I regularly churn out the occasional data-driven piece, like the “Over/Under” one, most of them are more about subjective response to landscape and personal interpretation of place. Not unlike what you were saying earlier – it’s helpful for me to kind of get my head around how I conceive of these places and their particular histories and the spatial relationships involved and all of that. Lizard brain human stuff, you know, like, “I feel exposed here.” Instrumental music is kind of good for this – stuff that if you were to write it down, it would feel kind of trite, but in writing music you have a space to sort of deal more directly with the nuances of feelings like that. And it compels me to be more attentive to the places I’m in. You know, like with the ocean stuff – what it feels like to have something moving and changing around you constantly, or in the shadow of a mountain, what it feels like to have something looming over you constantly, that kind of thing. It’s gratifying for me to think about stuff like that and figure out ways to tie them to other moments in my life where similar feelings pop up. MB: Oh, I’ll bet. Totally. Thank you, by the way, for letting me flip this around and interview you for a minute. BC: Ha, anytime. It’s probably good for me, really. MB: Do you like the work of John Luther Adams, the composer? BC: Oh yeah, absolutely! I’ve met him a couple of times. And man, yeah, he’s the greatest. Not only does he consistently generate this beautiful and thought-provoking work – and now he has a Pulitzer Prize! – but he really is also incredibly sweet, and approachable, and generous with his time and thoughts. I actually interviewed him when I was up in Alaska a bunch of years ago. He’s got an installation up there that you would love – it’s maybe my single favorite example of a data-driven work of art. Do you know about this thing? It’s called The Place Where You Go To Listen? MB: Huh! No, I don’t think so. BC: So, it’s at the Museum of the North at the University of Alaska in Fairbanks – they gave him, you know, a room. And it’s just a simple, blank, white room, with these glass panels lining one wall, but all the light and sound in the room are controlled by these live data streams from around Alaska carrying information about, you know, seismic activity, time of day, phase of the moon, geomagnetic activity, all that stuff. But you wouldn’t walk into the room and be able to be like “ah, okay, it’s 3:19pm and there’s an earthquake in the Aleutians” – it’s all very gracefully, elegantly filtered through the musical and artistic sensibilities of this one guy’s brain. It’s unbelievably beautiful and interesting. Your experience in this room is colored in all these subtle, surprising ways, but you’d never think to think of it as… you know, information, even though that’s the source material. You should definitely get up there if you can, but he also wrote a whole book about the process of designing the space and working with the programmers, all that stuff. MB: Wow, yeah – thanks! Sounds up my alley for sure. It’s in… Anchorage? BC: Nope, Fairbanks. I think he just modified it, too, in honor of its tenth anniversary – the museum let him come in to make some tweaks. MB: Nice. I’m writing this down, too. MB: Ha, but no, this has been a lot of fun. Thanks again for asking me to participate in this project of yours. I’m trying to think of things I want to ask you, too! BC: Oh, I know one – I wanted to talk to you about the educational side of your career. I know you teach workshops to kids and also to adults… have you noticed anything about how those different groups differ when it comes to representing their spatial experience of the world? MB: Hm. I’m not sure. BC: Like, I would kind of wonder… do little kids, for instance, map the places in their lives more interestingly because they’re uninfluenced by abstract understandings of what those places objectively look like? MB: Yeah, I need to do more work with kids to keep figuring that out.It’s hard, because they do have some pretty quickly instinctive experiences of place, but when we ask them to like put things on a map or whatever, it’s hard for them, because they haven’t really had time to work out, you know, where things are. But… I do slightly different things for kids and for adults, so it’s hard to compare. I mean, I know the answer we’d all want, which is like, kids are more instinctive and adults are more informed by looking at their phones, or whatever. BC: I’m actually way more interested by what it sounds like you are saying, which is that kids don’t necessarily have a sense yet of where things are in relation to each other because for the most part those concerns are irrelevant to them. A little kid doesn’t need to navigate, doesn’t need to get him- or herself anywhere, so why would he or she form a view of the world that was more detailed than, like, “my house is here and my daycare is... somewhere else”? MB: Yeah! I mean… I just did this thing where all the kids kind of got a map with the outline of Portland and the surrounding area, and then I asked them to fill in, like, places they’d gone on field trips, that kind of thing, you know, where things are. We just gave them a sense of where they were and then they could add on. I think the key thing with kids is finding, you know, where their most basic level of geographic understanding it – what the ingredients of their mental map might look like to start with – and then figuring out how they might try to arrange that spatially. Like, take their favorite place and kind of build out from there – and most kids are pretty good at that. They’ll make these adorable maps of their house and their neighbor’s house and all that. Thing that matter to them. But then it’ll be like… school! Or Grandma’s house or whatever. BC: I mean, yeah – their experience, in a sense, is like the portal thing we were talking about earlier. Especially for really little kids. MB: Yeah! You’re in a car and then you’re somewhere else. Bing! You're in Fort Williams. Bing! You're at an ice cream place. Yeah. So a big part is just giving them a framework for this stuff – "there's this peninsula, and most of you guys live down here, and there’s a biiiiig road that goes from here up to Portland, called Route 77,” and that kind of thing. "You know that bridge? It's over here." BC: Even if those relationships don’t necessarily resonate with their experience of the places in their life. MB: Exactly. But the general gist helps. “Most of the time you’re down over here, and this is where the water is, where you go to the beach, and Portland's up there, then there’s this big road that brings you up into the city.” I mean, really if you just get THAT down, you can slowly add pieces to it. But it’s hard, really – with both kids and adults – they’ll have a concept in their brain, but it won’t necessarily be obvious to them how to translate that into visual information, into a graphic like a map. It’s hard to know if the problem is with their geographic understanding or with their skills at translating that understanding onto a piece of paper. MB: Yeah, especially with kids. Because, you know, they’ll have a sense of where things are, roughly! But if you tell them to draw it on paper, it’s like…. yikes. It's not an obvious thing if you're not familiar with it. BC: I guess that’s a pretty big abstract leap in the first place, isn’t it? Just having to convert any kind of 3-D experience into a drawing. MB: Yeah! And we have senses of things, impressions, that don’t really hold up when you have to draw them. Like even with college kids – even with me! – I mean, I know what the United States looks like, but if I had to do it from memory? It would not be perfect! And like, the Middle East? Forget about it. BC: Yeah! Wow. That’s interesting to think about. It’s like the difference between having a thought and writing a sentence; you have to first figure out how to put it into language. It’s never going to be a completely faithful expression of what you think, even from the moment you start examining those impressions yourself. You don’t know where the holes are. When you're zooming around in your head, you can almost unconsciously skip right over the murky parts -- like how a DVD player jumps over a damaged area on the disc or something. MB: Yeah! Ha, that's good. Anyway, yeah, I'd like to do more stuff with kids. And the things with adults... I'd like to do more focused exercises. A project that helps the town, or builds over time, or something like that. I wish sometimes that I had a simpler -- I often feel like I'm juggling four or five things at once. You know? BC: Ha, sure! Me too. MB: Yeah, you know, I just work in all these different mediums and I've never really settled on one... but it's hard to do, like, five things really well. BC: Yeah. I very much wish we lived in a world where it was possible -- or necessary -- to do five things really well. You know? Well I mean, I think that's almost a perk of the fields you and I work in: that you kind of have to be a jack of all trades, to a certain extent. Or at least a jack of several trades. It keeps your brain from sinking into quicksand anywhere. MB: Ha, well you're certainly doing a good job of that. BC: Thanks. Eh, in certain ways, maybe. But come on, you certainly are, too! All this work seems like it could only have been done by someone with a pretty cross-disciplinary mind and skill set. MB: Yeah, thanks! Likewise, obviously. Yeah... I mean, you can do different things, certainly. And I like that. But you get to a place where -- well, you know, like, I'm a mom! And that's a really big part of my life. And time. So, as much as I know this work needs time and lots of diligent work in order for it to cohere and evolve, it's not... I mean, it's not the most important thing in my life, you know? BC: Yeah, for sure. I'm enormously impressed by parents -- I can't imagine how you balance everything. MB: But it makes me excited to get older! I mean... jeez, when I'm sixty? I'll just have all this time to devote to my work! BC: Do you find that you've developed a heightened ability to compartmentalize? Like, you know, between mom-world and art-world? Or is it all part of the same fabric for you? MB: Oh, no, definitely, I'm able to keep them separated. I think when I was a grad student, it was hard for me to figure out, like, when I was... off the clock. Like, when to stop thinking about ideas. I think it makes me better able to act on my ideas when I divide my time and energy up like that. BC: Huh! That's interesting. I admire you for having figured that out. Well, thanks so much -- we should probably wrap this up... unless you have any final thoughts? BC: No way; this was all awesome. Thanks so much for your time.